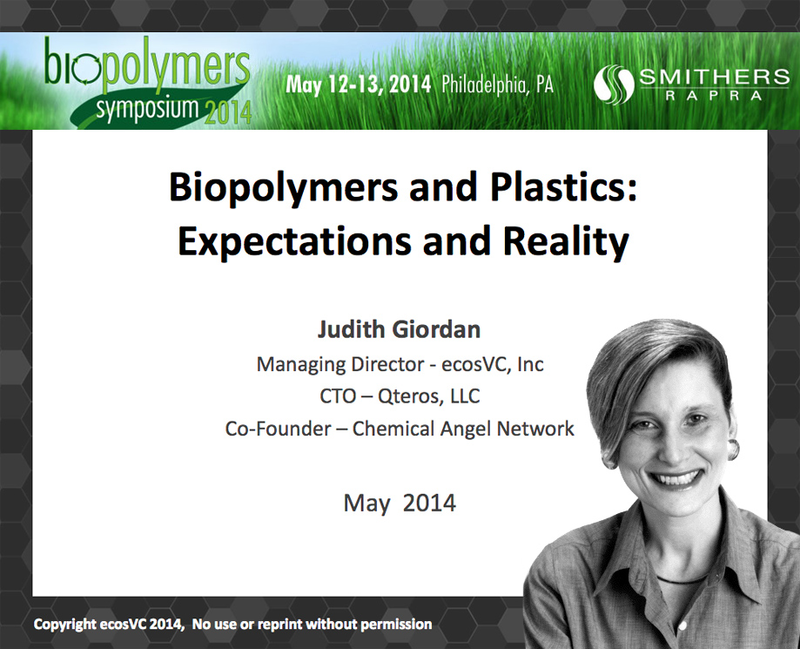 On May 12th, Judy gave the Opening Keynote at Biopolymers 2014 -- a Symposium bringing together key innovators in the bioplastic and biopolymers industry organized by Smithers Rapra -- entitled "Biopolymers and Plastics: Expectations and Reality." The promise of transforming traditional petroleum based value streams for polymers and plastics to biobased ones has seen its fits and starts. Larger investments in the first decade of the 21st century are declining and the specter of new, abundant and cheap hydrocarbon sources looms large on the horizon. How will biobased systems compete on the three key parameters for success: cost, performance and scale? And will the results be enough to transform expectations to reality? 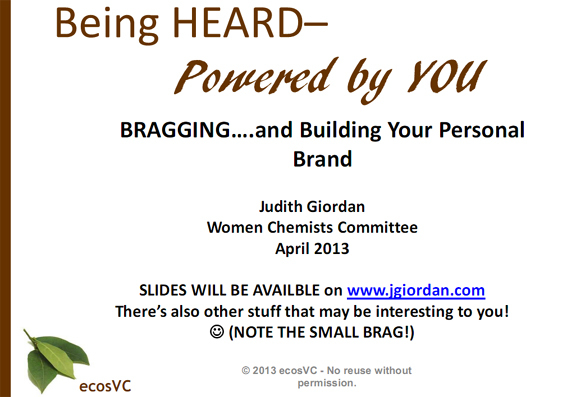 On May 8th, Judy was the featured speaker in the Inspiring Women In STEM Forum for her talk "Go Ahead... Brag!" This forum is organized by Delaware Bio, Delaware Sustainable Chemistry Alliance, and the Technology Forum of Delaware, and sponsored by Ashland Water Technologies. A successful STEM career is not only about doing great science – it is also about convincing and sharing with others why it is important and why we are the ones capable of doing it! One way women can become successful STEM leaders is through bragging. But bragging gets a bad rap. Shouldn’t we be modest and let the work speak for itself or let others brag about us? NO - bragging is not the problem, being comfortable doing it is the challenge. 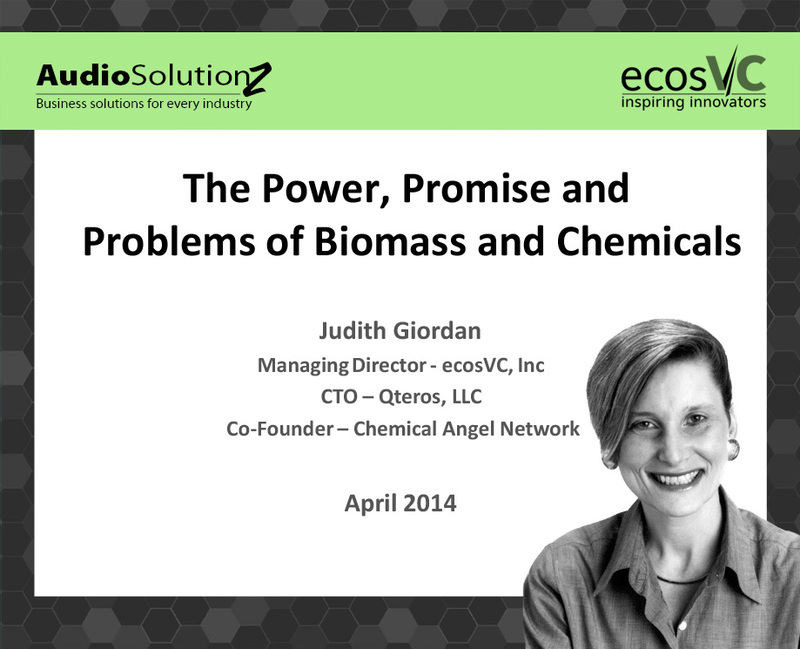 ecosVC’s Managing Director and Chemical Angel Network co-founder Judy Giordan moderated the Cleantech Panel at the recent Angel Capital Association Meeting held in Washington, DC. The aim of the panel? Gaining insights from Angel Investors who don’t usually invest in this space and sharing how they can become involved. Check out an article on the Cleantech Panel ("Cleantech Angels Say They’re Seeing “Green” in Latest Investments") and download Cleantech Investing as Part of Your Portfolio, presented during the Cleantech Panel! 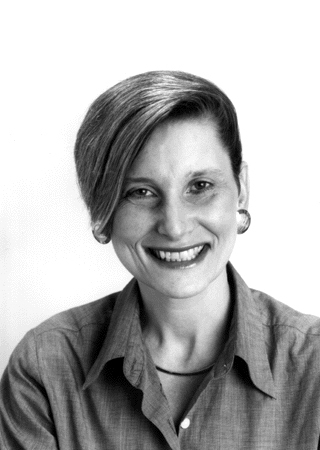 Judith Giordan presented at the 247th American Chemical Society National Meeting: Chemistry & Materials for Energy on March 18th, 2014. She presented Lens of the Market: Building innovations and innovators (PDF download) during the Best Practices in the Business Innovation Environment Session. Judy moderated the STEM Women in Innovation and Investing symposium at the American Chemical Society meeting in Indianapolis, IN, on September 10, 2013. 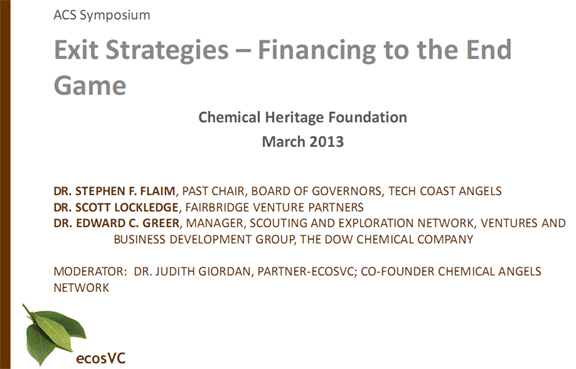 Her talk at the start of the symposium, "Value Creation... Capturing the Immeasurable Value Created by Women Innovators, Entrepreneurs and Investors," followed a wonderful introduction by Janet Bryant, Systems & Science Policy Analyst, Pacific Northwest National Laboratory, and Chair, ACS Chemical Innovation and Entrepreneurship Council (CIEC). This ACS symposium was co-sponsored by the following ACS divisions: SCHB, BMGT, WCC and PROF.
Judy Giordan spoke with Hannah Yates, Research Analyst at Green Power Conferences, about some of the key questions to think about on important developments in bio-based materials. 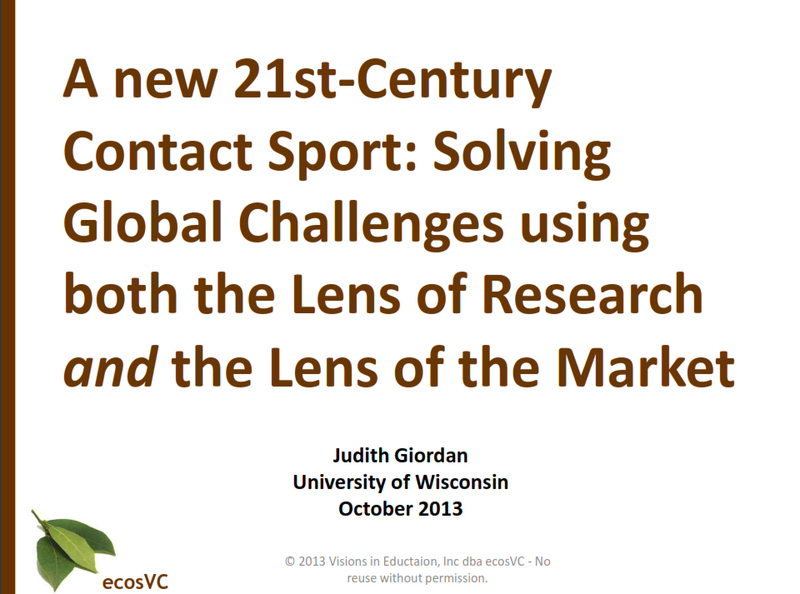 Judy will be a presenter at the upcoming World Bio Markets USA meeting in San Francisco, October 29-30, 2013, in the "Bio-based vs. Petroleum: Competing on Price, Performance and Quality" symposium during the conference. Judy Giordan was the featured speaker in the 2013 International Conference on Applied Mathematics, Modeling and Computational Science (AMMCS-2013) special session on Women in Mathematics on August 29, 2013. She kicked off the session with her presentation "The power of diversity: women's leadership in STEM fields. The role of innovators and innovation."